Changgyeong Palace, one of the four main Korean palaces, will stay open till 9 p.m. all year round, starting next year, for those who love to enjoy its night views, the head of the government office that manages the palaces said Tuesday. 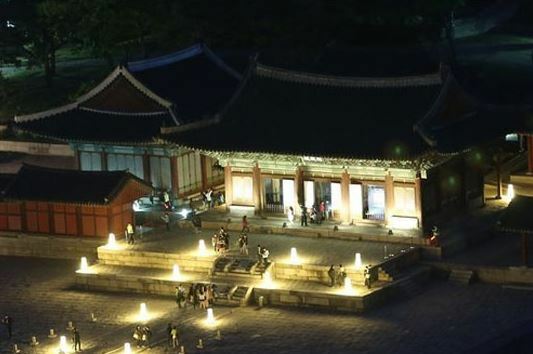 The Cultural Heritage Administration has allowed nighttime sightseeing of two palaces located in central Seoul -- Gyeongbok and Changgyeong -- on a limited basis. This year, Changgyeong Palace will open for night tour programs for 70 days and admit only 3,500 visitors a day. "Changgyeong Palace will stay open at night starting next year," Chung Jae-sook, head of the CHA, said when asked by a ruling party lawmaker about the nighttime use of the cultural property during a regular parliamentary audit into her office.